A while ago, I was sent a couple of items from 2 Korean brands to try out. We see many Korean brands available these days, but there are so many brands available in Korea that are not yet available overseas. When I was in Seoul, the choices were mind boggling and seriously. there’s no way to know what to buy at all! Add to that the fact that many Korean brands are for the most part, very affordable and the choices get harder. The 2 brands I was sent were by Innisfree and Tony Moly and are carried by online store IHeartKoreanBeauty which is based in Singapore but ships to Malaysia and worldwide (Edit: Website is defunct. Both brands are available in Malaysia at time of writing). 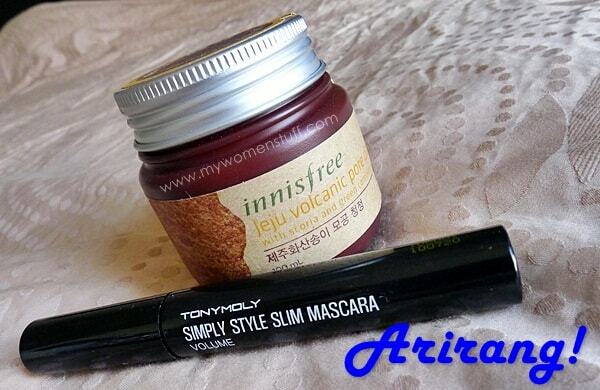 I was sent two of their bestsellers – Innisfree Jeju Volcanic Pore Clay Mask and Tony Moly Simply Style Slim Mascara. 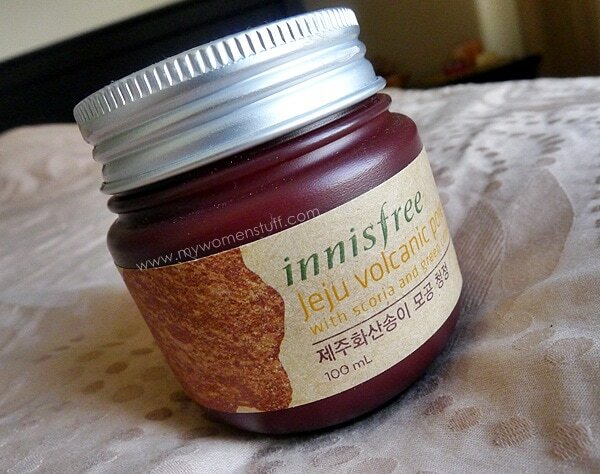 I’ll start off with the Innisfree Jeju Volcanic Pore Clay Mask because I think this one’s a pretty nice clay mask. It comes in a small 100ml jar and is as the name implies, contains volcanic clay from Jeju island in Korea. Volcanic clay is supposed to have antibacterial properties and absorb sebum and purify the skin. The thing about clay masks is that they tend to be drying and if you have combination skin tending to dry, like mine, you might just throw your hands up in horror at the thought of using this mask. But you know what? This is a clay mask that isn’t drying at all! I apply quite a thick layer of this pale beige mask on my skin and then let it dry while I go about doing my thing (usually watch tv) and unlike other clay masks I use, I do not experience a dry tight tingling feeling. The mask doesn’t dry out and crack like many clay masks do, and washing off is very easy. It doesn’t stick to my skin. As I have noted, my skin doesn’t feel very dry but it does feel very smooth and clean. That said, I do not use this one often. I’ve only used it three times since receiving it about 2 months ago, because I don’t have oily skin. So I use this mainly when I feel like my skin needs some purifying. If you have oily skin you could use it more often and it might be more beneficial. For me, 100ml can last a while. Not having tried anything from Innisfree before, I think this was quite a good introduction to the brand. A clay mask that isn’t drying on the skin. It leaves skin feeling very smooth and clean and brighter after use but does not unclog pores or blackheads as well as other clay masks I’ve tried. It is comfortable on the skin and washes off easily and does not have a strong scent so it is very comfortable to use. The other Korean product I tried was the Tony Moly Simply Style Slim Mascara in Volume which I took to mean its a volumizing mascara. I was told that this is a very popular mascara. Priced at just S$8.50 I have no doubt of its affordability. Its probably even cheaper than many pharmacy brand mascaras in Singapore. We don’t get Tony Moly in Malaysia yet at this point in time.We apparently get Tony Moly in JB and rumours are in KL too. When you have skinny short lashes, the thought of a nice inexpensive volume mascara is very exciting. If it works that is. Unfortunately for me, the Tony Moly Simply Style Slim Mascara was a wash out. I also find that the formula takes a while to dry, so if I’m not careful, it smudges quite easily. Once it dries, its perfectly fine but not before. Fortunately, these days, ever since I learnt the tip to put on mascara first before eye makeup, I don’t botch up my eye makeup. I can clean off smudges before I apply colours. But it still irritates me when I’m in a hurry. I hope its not just me having this issue. Since its a bestseller item I’m guessing there are other ladies out there who find it good enough to purchase and repurchase. I however do not number among them, sorry! 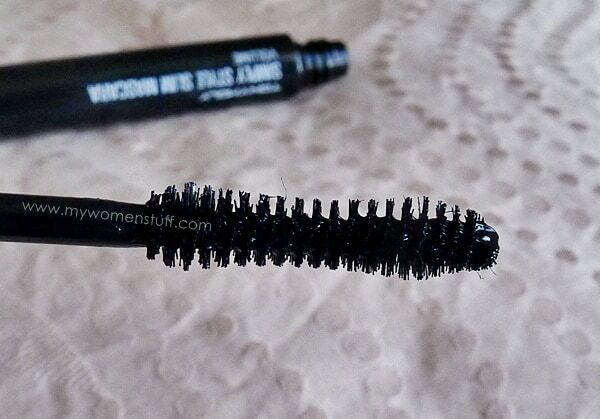 A very affordable mascara that is very easy to apply. The brush gets to each lash very easily and the formula is quite light. However it causes my lashes to droop and takes a while to dry. Once dried it does not smudge but washes out very easily with warm water. A good mascara for a natural day look. Not one I’d suggest for a dramatic eye. Both Innisfree and Tony Moly are now not available in Malaysia Other than the Tony Moly Snail Cream I tried before this, these are the only items I’ve tried from both brands so far. Both products featured were provided by a now defunct web store. I saw the store in Korea when I was there but for some reason I wasn’t intrigued enough to go in and try anything. I guess I didn’t do my homework because I read that their skincare is better than some of the other brands. They are by Amore Pacific, one of the biggest cosmetics companies in Korea and mother brand of Laneige too. I’ve heard of Amore Pacific. Supposed to be a super-duper expensive Korean brand! My pores need some decongesting! Thanks for the reminder. 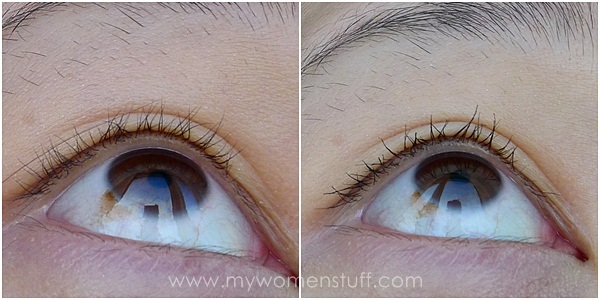 That mascara is BAD for Asian lashes, lol! I have the innisfree clay mask and i have oily skin, blackhead is my best friend and it just wont go!!!!! But this help alot after using this it does help to lossen up the blackhead and it’s not drying at all, LOVE IT!!!!!!!!!!!!!!!!!!!!!!!!!!!!!!!!!! The clay mask sounds nice! I have oily skin and even I stay away from drying clay masks. It’s never good to strip the skin completely of oil, right? Oh I just received 3 sachets of the mask from my reader. Tried once and LOVE IT!!!!!! thinking of grabbing a tub!!! XD Thanks for the review!! On my last trip to Korea, I think the Volcanic range was just launched so I didn’t give it much thoughts because I was crazy about their Olive Real range, particularly the lotion. I’ll definitely will look for this product when I’m in Korea next time. My fave product of theirs is the Apple Juicy Brightening Peeling Gel (works like Ginvera’s Marvel Gel) for quick exfoliation in the morning. The ‘toing toing’ feeling after using it always perks up my dull skin day haha. I really recommend this product. I’m also using their 02 Pore Care Mask. Apply the gel over your face and 1 min later it will turned into small bubbles which gives tingling feeling~ it’s so quirky and weird. Haba has a mask like this too but innisfree is the cheaper version and works well for me. Eeeps~~ the mascara (0-0) I’ll stick to my Max Factor’s thank you very much. Tony Moly’s product doesn’t appeal to me at all, I like plant based skin care products, which is why Innisfree is my fave. I think the only memorable product of Tony Moly is the snail cream, I saw Chinese women buy these in bulk. Aiyaiyai, things we do to be beautiful! I love clay masks! I use them very sparingly though, so not to wreak havoc on my sensitive skin. Currently, I’m using Queen Helene’s Julep Mint Masque and it works wonders. I might try that one once my supply ends. One of my New Year’s resolutions is to buy some Asian beauty brands roll on January! Oliva real cream My skin is very dry and it is improved after using the cream. I like the red wine sleeping pack as I just leave it on the face overnight and my skin become smoothly in the morning. You should try more products from Innisfree. They aren’t pricey and most of the products work wonders. I would recommend green tea seed serum (lightweight hydrating serum), soybean energy essence (sk2 facial treatment essence dupe), super volcanic pore clay mask (upgraded version of jeju volcanic pore clay mask), bija anti trouble spot essence (for acne). they are not expensive at all. 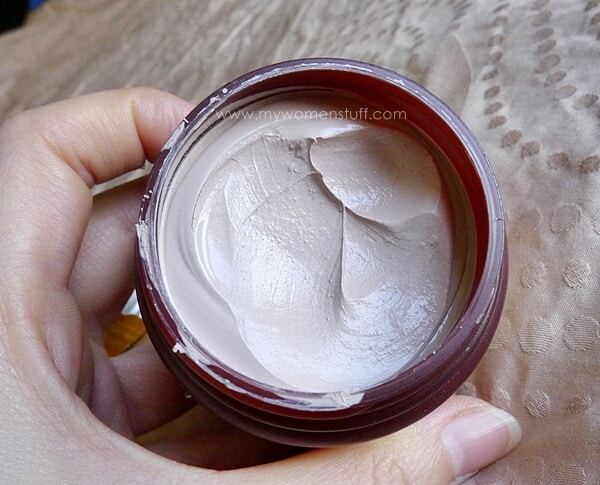 How much the innisfree volcanic pore clay mask? I really want to give a try cause i got an oily skin.